Sir Richard Henry Bonnycastle (17911847) was an English officer and military engineer who served in the War of 1812 and ultimately settled in Canada. I stumbled upon copies of some of his charts and maps, became infatuated with the hand-lettered titlesand the result is the eponymous Bonnycastle. The font has a bold weight and an italic style but is intended as a stylish standalone, evocative of its period in history. 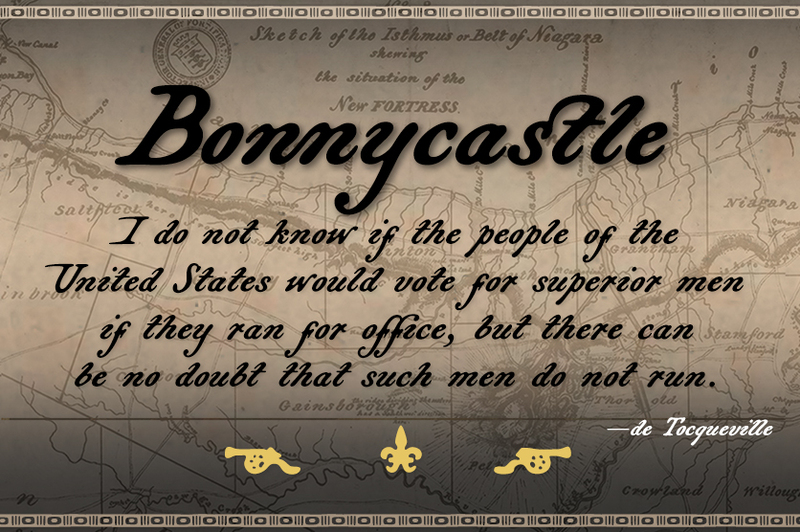 Bonnycastle might prove most useful as an eye-catching titling face on branding materials, event posters, book covers, presentation graphics, historical illustrations, and the like. OpenType features include true small caps, alternate upper- and lower-case alphabets, dozens of ligatures, contextual and discretionary alternates, lining and old-style figures, many cartographic ornaments, and full support for Central and Eastern European languages.more than 1,100 glyphs in all. US$39.